A line of Interstellar warships of the not too distant future. They can be used with the names and designations provide, or they can be redesignated appropriately for use with your favorite games. These items are kits. 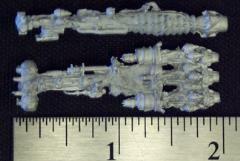 They are fine pewter metal castings, unassembled and unpainted for use with your favorite games.